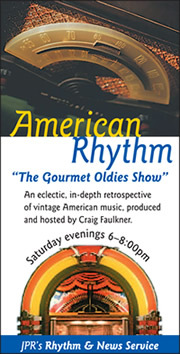 Craig is the producer and host of American Rhythm – The Gourmet Oldies Show, a long-running vintage music program heard on the Jefferson Public Radio network throughout southern Oregon and northern California. It is an eclectic and in-depth retrospective on vintage American music. You can hear American Rhythm on Saturday evenings from 6 to 8 pm pacific time on the Rhythm and News service of the Jefferson Public Radio broadcast network, or live-stream audio during that time at ijpr.org. Click on the "Rhythm & News" tab, then pick the "listen live" option from the list.